Enjoy more than a full day of music without recharging, thanks to 33 hours of battery life. The headphones will pause when taken off and resume playing when placed over your ears. 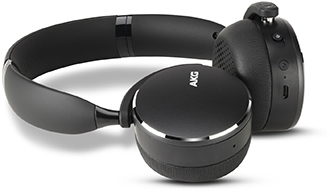 Easily adjust the volume and audio levels with controls on the ear cups. Premium materials and subtle design ensure the headphones look and feel as good as they sound.